The preliminaries are over for Scappoose, which will open its first Class 5A Northwest Oregon Conference season at home at 5 p.m. Tuesday against Putnam. The Indians completed a challenging preseason with an 11-0, five-inning loss Wednesday to No. 1-ranked Crescent Valley at North Marion. For CV, it was the first game of a doubleheader; the Raiders hit the field shortly after topping Scappoose and knocked off the home Huskies, 4-0, halting the No. 1-ranked 4A team's perfect season at 9-0. Scappoose coach Cameron Webb was pleased, though, that his team struck out only twice and made just one error in the Crescent Valley game. "We made some steps forward," he said. "Crescent Valley's pitchers just did a better job of getting ahead of our hitters, so we found ourselves in disadvantage counts, and our guys missed some spots and they capitalized. "But we told the guys to keep in mind what we're capable of and to not let that impact the way we define ourselves." Scappoose High's Chase Elliott carved out a 2-over-par 73 at Glendoveer Golf Course on Monday to lead the way in a Northwest Oregon Conference match. Eliottt began his round with a pair of birdie 3s in shooting par 36 on the front nine. "A solid round for Chase," Scappoose coach Ryan Svenson said. "The great thing is that he's still not playing his best golf, which means as the season goes on and he tightens up some things, he has the ability to go really low." The runner-up, Owen Tunstill of La Salle Prep, had nines of 42-38 in his 80. Third-place Andrew Keepes of the Falcons shot 43-41—84. Wilsonville edged Scappoose for low team score. The Wildcats totaled 353 strokes, while the Indians had 356 to nose out third-place La Salle Prep (358) and St. Helens (363). Wilsonville had all five of its varsity golfers turn in rounds of 85-92. Behind Elliott, Scappoose's next two scorers were Jaden Holmason and Cooper Ragan, both at 92. Caleb Glenn shot 99, and DJ Backus rallied for a 101. "Cooper turned in a great round in his second-ever varsity match. He's getting better and better every day," Svenson said. "Jaden and Calen turned in solid rounds, and CJ shook off a rough front nine to score 41 coming in." For St. Helens, Tyler Tolleshaug (89), Alex Cross (90), Kalvin Budge (92) and karson Miller (92) provided a balanced 1-4 punch, with Caden Willby at 103. Svenson also noted that the Scappoose JV golfers posted good nine-hole scorers, with Weston Spang's 48 leading the way. "The guys keep on working to get better," Svenson said. "Most of them put in a lot of time over spring break to stay sharp and improve. I think our best rounds of golf are ahead of us." The next league match is Monday at Stone Creek Golf Club in Oregon City. The St. Helens Lions took first in a Northwest Oregon Conference match played Monday at Glendoveer Golf Course, defeating league rivals Wilsonville and La Salle Prep. The Lions finished with a modified Stableford score of 137 (high total wins), while Wilsonville scored 113 and La Salle Prep had 105. St. Helens freshman Alexus Burgoyne (43) and senior Emme Paullus (42) placed third and fourth. Juniors Maddie Holm (29) and Mackenzie Carlson (23) completed the team scoring for the Lions. "Our girls were very excited," coach Jared Phillips said. The top two individuals were Emily Hawkins, La Salle Prep senior, at 50, and Sabyn Thoune, Wilsonville senior, at 41. Wilsonville and La Salle Prep finished seventh and eight at state a year ago. The battles between the Lions, Wildcats and Falcons figure to continue the rest of the spring season, with the next tournament set for Tuesday at Stone Creek Golf Club in Oregon City. It's the home course for La Salle Prep. "We have a tough challenge," Phillips said. "The back nine of that course is particularly tough, but we are ready for the challenge." The St. Helens won seven of eight matches to defeat Woodburn on Monday. Highlights for the Lions included a first varsity win, 6-1, 6-2 at No. 4 singles, for freshman Drew Erickson, along with a come-from-behind victory by the doubles team of juniors Jenna Pence and McKenna Coddington. Down 5-2 in the third set, they pulled it out 7-1 in the No. 1 doubles spot. "All the girls played great," St. Helens coach Mark McQueen said. 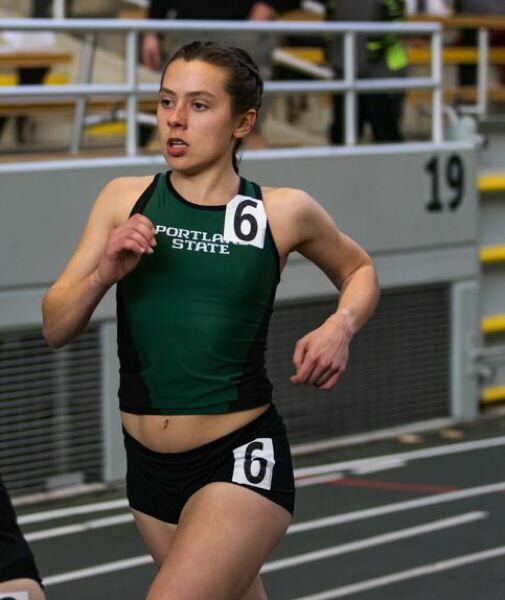 Linnaea Kavulich, a freshman at Portland State and former star at Scappoose High had an impressive debut in the 3,000-meter steeplechase. She posted the third-fastest time ever by a Viking, finishing in 11 minutes, 14.99 seconds in last week's Mike Fanelli Track Classic at Chabot College in Hayward, California. The mark was just over three seconds shy of the No. 2 time on the all-time PSU charts, set by Mandy Peterson and on the books as the school record for 15 years until it was surpassed last year by current Viking Sarah Medved. Kavulich placed second in her section of the steeplechase, little more than five seconds behind Haley Beaumont, a junior from Hawaii. University of Oregon freshman Hannah Galey went 2 for 11 with a run scored and RBI as the Ducks went 1-2 on the road against Stanford. The former Scappoose High standout started in right field and drove home a run in the third inning of the series to boost Oregon's lead to 5-0, but the Cardinal climbed back and won 7-6. The Ducks (13-18) have four nonconference games slated for this weekend, all in Columbia, Missouri, where they will play Missouri and Pittsburgh twice each. • Oregon State senior infielder Michelle Sass from St. Helens High started five consecutive games in right field this past week — three at seventh-ranked Washington and two at Portland State. She was 3 for 11 with a double, walk and two runs scored. The Beavers lost three to UW, then swept PSU. Oregon State (19-13) returns to Pac-12 play this weekend in Corvallis, facing Stanford at 5 p.m. Friday, 6 p.m. Saturday and 1 p.m. Sunday.